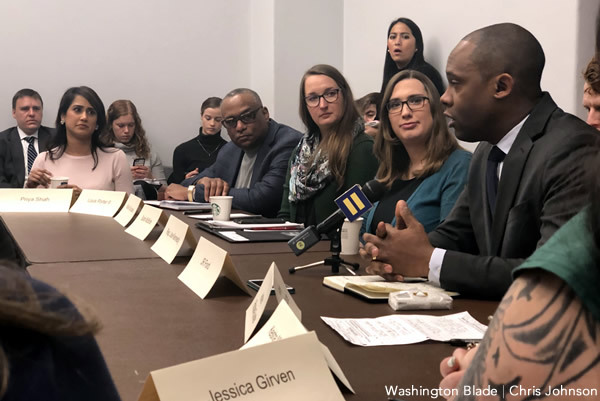 The parents of transgender children met on Capitol Hill Wednesday to share stories about hardships their families have encountered, including anti-trans policies of the Trump administration. The parents gathered for a one-hour meeting at the Cannon House Office Building for a public meeting hosted by Rep. Joseph Kennedy III (D-Mass. ), chair of the Transgender Equality Task Force. The meeting followed a two-day summit of the Parents for Transgender Equality National Council at the Human Rights Campaign building in D.C.
Rachel Gonzales, who lives in the Dallas area and is the mother of three children, told the story of how her transgender daughter “became progressively anxious and depressed and angry” before she transitioned. “My husband and I were really at odds with how to handle her increasing need to feminize her presence,” Gonzales said. “And, as she became more aware of other people’s perception of her as a boy, she just hit a wall where she expressed to us that she could not go on any longer with anyone thinking she was a boy, that she needed Santa Claus to turn her into a girl. That changed, Gonzales said, when she allowed her daughter to transition socially by starting to wear girls’ clothing and growing her hair long. Both Gonzalez and her transgender daughter testified before the Texas Legislature two years ago when lawmakers sought to pass an anti-transgender bathroom bill. The legislation ended up being defeated. Louis Porter II, formerly executive director of the Council for Minnesotans of African Heritage, talked about his experience raising his non-binary gender expansive child named Zeam, saying he was thankful for the support he found from fellow black elders in his Southern Christian tradition. “I haven’t met a parent yet who doesn’t worry, but when your child is transgender and black, you worry even more so,” Porter said. Priya Shah, a gender and sexuality studies teacher in Orange County, Calif., recalled crying last year when Kennedy during his response to President Trump’s State of the Union address, mentioned parents raising transgender children. “She didn’t even know the word transgender, she didn’t know that it was something that you could be, and she was so scared to even tell her family,” Shah said. At her daughter’s private school in California, Shah said her daughter wasn’t allowed to transition and was forced to wear a male uniform and go by her old name and male pronouns. At that time, Shah said she started teaching her daughter through home schooling and sued the school, which ultimately changed its policies and started training its principals. Shah said her daughter now is a straight A student and in programs for gifted students. Keisha Michaels, who’s black and a social worker, became emotional when she recalled the mortality rate for transgender women of color. A common theme among the parents at the meeting was the need to pass the Equality Act, which would amend federal civil rights law to explicitly include LGBT people and ban anti-trans discrimination in schools. JR Ford, a D.C.-based cybersecurity expert who lives in D.C., talked about the importance of the legislation to ensure protections for transgender kids. Sarah McBride, a transgender advocate and spokesperson for the Human Rights Campaign, said during the meeting the Equality Act would be introduced in the “coming weeks.” Rep, David Cicilline (D-R.I.) has sponsored the legislation in the U.S. House and Sen. Jeff Merkley (D-Ore.) has sponsored the legislation in the Senate. Another theme was the anti-transgender polices of the Trump administration. When Obama-era guidance requiring schools to allow transgender students to use the restroom consistent with their gender identity was rescinded in 2017, Ford said he approached the White House from the street and shouted at the leaders inside. Jessica Girven, the mother of a transgender daughter in the U.S. military stationed in Germany, became angry when she recalled the Trump administration rescinding the policy ensuring non-discrimination for transgender kids in school. One participant in the meeting who shared an unexpected story was Rep. Jan Schakowsky (D-Ill.), who talked about her soon-to-be 21-year-old transgender grandson Isaac and his process of transitioning. Schakowsky said her grandson is preparing to have gender reassignment surgery for a double mastectomy and has had eggs frozen to ensure he can be a biological parent in the future. Other lawmakers in attendance were Reps. Sean Patrick Maloney (D-N.Y.), Mary Gay Scanlon (D-Pa.), Mark Takano (D-Calif.), Chris Pappas (D-N.H.) as well as Rep. Jennifer Wexton (D-Va.), Mike Quigley (D-Ill.), Gil Cisneros (D-Calif.) and Alan Lowenthal (D-Calif.).